Every now and again I am presented with something genuinely intriguing. A fellow collector friend of mine recently acquired the following which has really interested me, and I thought it worthwhile bringing it to the forums attention. I have my own ideas concerning this helmet but I’d rather not colour other people’s opinions and just set the topic free for people to comment as they so wish. The helmet has a certain amount of provenance attached although I cant detail this as this point. 2-part lenses, clear fronting an amber back. I'm assuming there's nothing people dont want to talk about in an open forum - which is why its posted here. However if you need to contact me then my "jez275 (at) gmail (dot) com" is best however I'm under certain obligations not to reveal any further information at this point. Wow, thanks for posting these. I wonder if this is one of the two non-screen-used helmets but particularly the one Brian mentioned that was used as an experiment to try different dome mountings. The holes in the crown do not correspond to the holes and tab hole positions of the masks currently in the fandom - in fact, the holes are further away from the rear edge. It looks a lot like a TM but without all the paint touch ups, dings, dents and damage of the Tantive IV screen-used. Addendum: This is quite something. 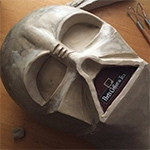 Could it be that this is the first time the community has seen a complete mask and dome ANH-production prop? Thanks for posting these Jez! This is ultra intriguing - it's certainly a bloody nice looking helmet. Lets see what Brian thinks! Very nice jez. I agree..will be interesting to see what Brian thinks. Wow, what a coincidence I visited Starwarshelmets just last night. Very interesting helmet/mask, it has a very good look to it, got any side shots of just the face? I've seen one of those latches before but I can't remember where. No evidence of having had tabs or tusks (these aren't negatives btw). Is that lump of wood (I don't know what it is ) inside the dome a spacer? The paint looks very thick in places, this (like the TM) may have even more detail hidden beneath. Can't keep my eyes off this thing now. Well, I had a nifty reply all set to go til my power went out....friggin storms. Now I can't see the pics. One thing I noticed was it looks like foam was once glued in place behind the grill and was either ripped out or has decayed to nothing. Who do you have to screw to own a helmet like that??? First the DarthJones, the TM (even though it's technically ESB), then the SithLord (still kicking myself over losing that one, 60 bucks! 60 bucks I tells ya!!! ), now this. Awesome helmet, thanks for sharing Jez! WOW!! something NEW! about vader almost every week. Cool. Thanks for posting. Very interesting looking vader. Some areas of the faceplate appear to have been altered/modified and appear more ESB than ANH, mainly the nose, the mouth walls, the cheeks and the tusk tubes. The dome attachment looks similar to the Pyre vader dome attachment. It's definitely an authentic cast. Looking forward to hearing more and seeing more of this helmet. Who do you have to screw to own a helmet like that??? Thanks for the input guys. It is a very interesting helmt since it has some tells that suggest it could be VERY important and alsosome others which are either missing or confusing (tusks being one). I too wish I know how people get hold of stuff like this - as I too wouldlove somethng like this my my collect. However I have a feeling its got a lot to do with being in the right place at the right time! Is the widows peak without the indentation? Authentic cast,Modified in parts and incorrectly or incompletley finished. Thanks for sharing Jez very interesting.